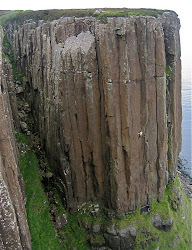 Guided rock climbing on the Isle of Skye. 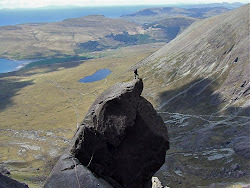 As well as having the best scrambling in the British Isles in the form of the Cuillin ridge Skye also has a great variety of fantastic climbing. You can climb on Gabbro, basalt, dolerite and sandstone each with its own unique characteristics. There are high mountain crags and atmospheric sea-cliffs. In short there is something for everyone and the great variety will ensure that you never get bored. It has been known to rain on Skye occasionally but even that does not always stop us. The geography of the island means the sea-cliffs in the north of the island can be bathed in sunshine when the mountains are hidden in rain clouds. Sometimes simply moving from one side of the Cuillin to the other is enough to escape bad weather. Depending on the number of days booked the Skye rock climbing course gives you the chance to sample some of the great routes and fantastically varied climbing available on the island. Long mountain routes in the Cuillin are what most climbers come to Skye for and with good reason. The incredibly rough Gabbro offers incredible friction and there are classic routes at all grades many with great history behind them. A full range of mountaineering skills are called for as descents from many of the crags can be complex and demanding. Maybe because of that, the satisfaction from competing a long route, on a glorious summer day and walking out, as the sun sets over the Atlantic, is every bit as comparable with long rock routes in the Alps. Far less well known than the Cuillin the rock routes of Kilt Rock are every bit as unique and special, possibly even more so. From flat grassy fields dramatic basalt columns drop steeply towards the sea. If you have seen pictures of Devils Tower in Wyoming this is the UK’s version! Most of the routes are single pitch but are up to 50m long following stunning cracks and grooves that require a good range of jamming and bridging techniques. That the base of the crags sits above another 50 or so meters of almost vertical grass and scree just adds to the exposure. Abseiling to the base of the routes can feel very intimidating on first acquaintance. If that all sounds a bit too exciting the same unique experience of climbing these basalt columns is available on the nearby Staffin Slips area which is not a sea cliff and requires no abseil approach. If you are searching for a slightly more relaxing day than climbing in the Cuillins or Kilt Rock then Suidhe Biorach near Elgol could be it. Single pitch routes on a sea-cliff with a sunny aspect and a good ledge at the base of the crag. The rock is Jurassic quartz sandstone that is generally quite steep with good pockets and protection. The setting is completed with wonderful views over Rum and the southern Cuillin. 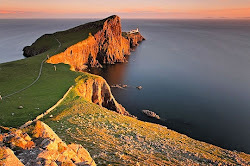 The most westerly point on Skye it is the perfect place for climbing in afternoon sunshine then watching the sun set over the outer Hebrides. The rock is dolerite and while the cliffs of An T-Aigeach offer long serious routes on sometimes less than perfect rock, in complete contrast the Financial Sector offers a large number of excellent single pitch routes on excellent rock not dissimilar to Fairhead in Northern Island. It is not necessary to commit to a course solely to go rock climbing OR scrambling on Skye. It is also possible to book a course say for 4 or 5 days and decide each evening what the following days activities will entail. This has the advantage of allowing greater flexibility with the weather and can therefore ensure that in a week of mixed weather more can be achieved on each day. For rock climbing in the Cuillin you should be happy seconding routes at VD or above. For rock climbing elsewhere on Skye (Elgo, Neist, Kilt Rock) you should be seconding VS as a minimum and to get the best from these areas you should be seconding HVS comfortably. We can also run introductory climbing courses in the Cuillins for those with little or no climbing experience. The price for this trip is available on request. It depends on a number of variables including number of people, length of trip and whether clients and guide can car-share to keep transport costs down and be kind to the environment.